In this day and age when all of us are running behind comfort and lavish lifestyle, an accommodation does not mean anymore simple stay. And if the stay is associated with one of your most desired trips then expecting few extra points is obvious. A wildlife trip to Corbett National Park is such a tour where you can expect all lavish comfort even though you are planning to spend time amidst unbound wilderness. Far away from the maddening crowd and honks of the metropolis, this national park lets you spend quality time amidst some of the most exotic species of birds and animals among which tiger ranks at the top. However, activities like fishing, angling and day long safari trips can make you a little tired. Never mind! 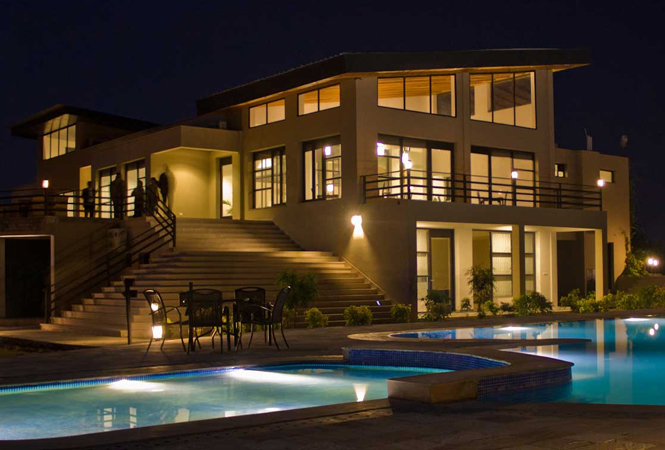 To bring you out of any such instances of exhaustion, well-facilitated properties are built around Corbett that offers exclusive stay, dining and spa facilities. If you are looking for all these facilities at the same place our list of hotels extending spa services in Corbett will be of ultimate help. Here is a brief idea about the best of the lot. Travellers, who are specific about the kind of comfort and luxury they want during their stay in all possible situations, should go for Wood Castle and Spa Resort near Corbett National Park. Located on the foothills of Shivalik Range at a picturesque setting, the resort is flanked by the verdant forest of Corbett on one side and Kosi River on the other. Appealingly designed building of Wood Castle presents five different types of accommodations known as Presidential Suite, Cottage, Duplex, Super Deluxe and Deluxe. The dining options at Food Exotica (multi cuisine restaurant) and Tigress Grill serve scrumptious dishes as the expert chefs love to experiment and introduce new dishes. To energise you from inside the resort brings classy spa facilities that soak all your tiredness after a daylong safari and adventure activities. The in-house health-club helps you to continue your work out sessions even when you are out on holiday. To make you feel relaxed in summer, the resort has a beautifully designed swimming pool which looks bright at night for the reflection of the multicoloured lights. 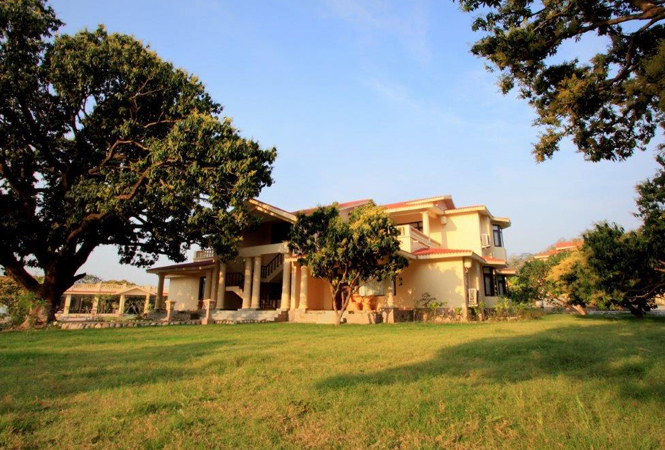 Located on the banks of the monsoon river Dhela, the Golden Tusk is a stylishly designed property set over 7 acres of land near Corbett National Park. 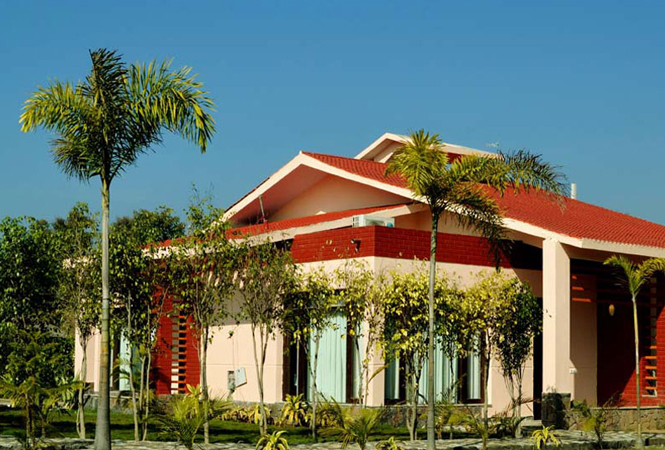 Built in front of the verdant deciduous forest inviting refreshing breeze this resort appears to be one of the best accommodations in Corbett National Park. The property hosts 40 spacious rooms divided into six categories such as Tiger Suite, Villa Grande, Villa, Forest View Suite, Country View Suite and Luxury Tents. The resort also offers multicuisine dining options in different dining spaces set around the pool and lawns. For customised safaris and sightseeing tours the resort has specialised travel guides. After a daylong excursion and adventure activities your day in the Golden Tusk comes to an end with a relaxing dip in the swimming pool or refreshing Ayurvedic massage offered in a wellness centre and spa. If you are looking for the best luxury spa resorts in Corbett, The Den is the ultimate solution without any second thought. 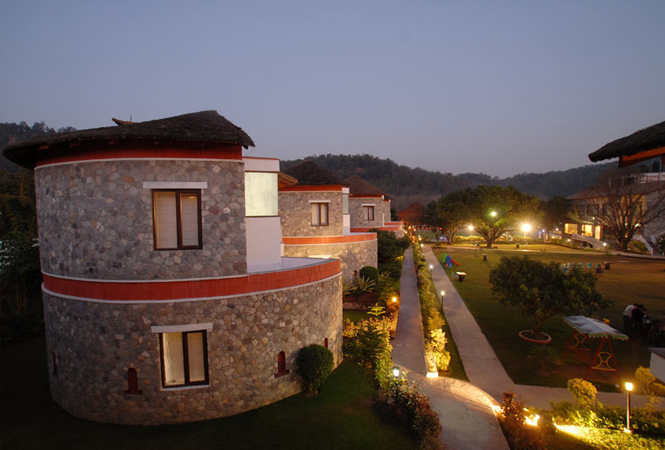 Built with utmost grace and elegance the resort offers you the perfect ambience to unwind in the lap of nature. Nestled on the edge of a small hill near Kosi River, the resort brings 50 sun-lit cottages and several world class facilities. The restaurant called Hunts caters delicious cuisines which are authentic. For the tourists seeking privacy, the resort rustles up intimate gourmet meals at beautiful locations of the property such as river deck, pool side and lawns. To relax your strenuous body go for a soul soothing massage session in the hotel’s gracefully designed spa where well trained massagers will rejuvenate you using a blend of organic plant extracts. Built amidst creatively manicured garden, Corbett Wild Iris Spa and Resort is an ideal accommodation to choose from the premium spa hotels & resorts in Corbett. To churn out the feel of adventure and wildly atmosphere this wildlife resort is set apart from the hum-drum of crowded places. To meet the needs of the travellers of different class and tastes the resort brings three different categories of cottages called Tiger Suite, Leopard Duplex and Deluxe Cottage. The in-house restaurant of the resort serves delicious cuisine. To make you feel rejuvenated the in-house spa service works as a proper healer. To minimise the hassle of booking a safari, you can take the help of in-house travel desk. Exclusive – not for its look but for the facilities it offers, hotel Nadiya Parao makes your wildlife holidays in Corbett fan-filled and energetic. Located at a distance of just 4km from the Bijrani Gate of Corbett, this exquisite property introduces you to its 34 air-conditioned luxury cottages that are designed maintaining the elegance and charm of natural beauty. Depending on their surroundings, the rooms are further divided into separate categories such as Tiger Camp, Habitat Hotels and Monsoon Forest. More like a thatched household, the cottages of Nadiya Parao are facilitated with all modern amenities including a king size pool in its yard. The airy and spacious dining space opens in different sides towards the private garden of the property and Kosi River. Indian, Chinese, Kumaoni and Continental dishes are served along with a-la-carte menu and barbeque snacks on demand. The spa service offered by the resort is of world class level and re-energizes you after the prolonged excursion and adventure activities.